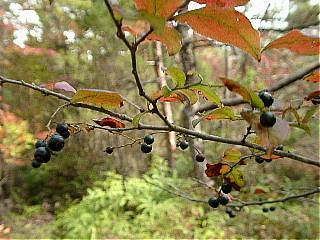 "Natsuhaze" like to the blueberry might be seen when taking mushroom and entering the mountain in autumn. It is sour and tastes nostalgic though the number of those who eat decreased recently. Feature of "Natsuhaze" or "Yamanasubi"
Bark has torn to length in ash brown. The young branch reddish brown. It is a single leaf and there is a rough hair on the leaf of alternate. I think feeling rough. The flower of the temple bell type that looks like the blueberry blooms during about the May-June. The color of the flower is a spotted color that mixes red, green, and white. 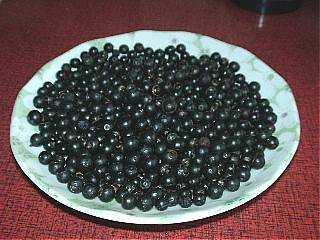 Fruits ripen to deep purple color-black in autumn and it is possible to eat. Acidity is strong though it is sweet. It looks like the blueberry of the same belonging well. It can eat a fruit sweet because of sour feeling. I think it is good for eyes because it is the same kind as the blueberry. It came to be called "Natsuhaze" because it turned red like the gobioid since summer. Photograph of "Natsuhaze" or "Yamanasubi"
I ate "Natsuhaze" in mountain of autumn of childhood a lot. It is sour feeling. It becomes purple in the eaten aftertaste. It takes a lot and it is delicious with a lot at a time. After it eats, the tongue becomes purple. 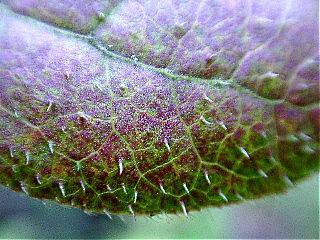 It is a macro photography of the leaf of "Natsuhaze". A rough hair has grown in both sides of the leaf. It went matsutake mushroom hunting every Sunday in my childhood. Every time in those days, I caught matsutake mushroom fully basket made of the bamboo. "Natsuhaze" was just in the mountain in those days and there was a life. Children, rather than take the mushrooms, "Natsuhaze" It was fun to adopt a better eating. Now everybody "Natsuhaze" There is no man take. "Natsuhaze" has quietly put the fruit in the mountains. This year, "Natsuhaze" I adopted a lot of white liquor and dipped in honey. I'm not keen on alcohol. It was like wine. And grape juice was like drinking diluted. Since this is the same type blueberries, I think the prevention of eye diseases. After it soaked it to white liquor, the truth of "Natsuhaze" was broken and reduced with the mixer. I think it is very good for the body because I can eat everything by doing so. I am a Business owner of daii.jp, and a Engineer.